This article is about the football player. For the basketball player with a similar name, see Darrick Martin. Martin with the Ravens in September 2008. Derrick Jerome Martin (born May 16, 1985) is an American football safety who is currently a free agent. 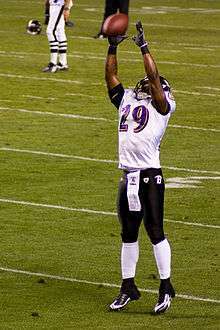 He was drafted by the Baltimore Ravens in the sixth round of the 2006 NFL Draft. He played college football at Wyoming. He has also played for the Green Bay Packers, New York Giants, New England Patriots, and Chicago Bears. Martin attended Thomas Jefferson High School in Denver, CO where he led his team to the quarter final stage of the 2001 state playoffs and also the 2002 state semifinals. Martin also excelled at basketball where he was team captain. He was named Gatorade player of the year as a senior. Martin played college football at the University of Wyoming where he played in 30 games making 24 starts and finishing his college career with 134 tackles and six interceptions. Martin was selected by the Baltimore Ravens in the sixth round (208th overall) in the 2006 NFL Draft. He was the first ever player to be selected by the Ravens out of the University of Wyoming. In his rookie season he played in eight games posting four tackles. He made his NFL debut versus the Carolina Panthers on October 15. In the 2007 season he made 32 tackles. On September 5, 2009, Martin was traded to the Green Bay Packers for tackle Tony Moll. He was the Packers' Special Team ace in the 2009 season, and was one of the Packers two Special Teams captains (along with linebacker Desmond Bishop) in Green Bay's playoff loss at Arizona. Martin was placed on injured reserve when he sustained a knee injury against the Washington Redskins on October 10, 2010. Martin also recorded an interception, which he returned 15 yards that season. On March 2, 2011, Martin was released by the Packers. Derrick Martin signed with the New York Giants on August 15, 2011. He got his second Super Bowl championship in a row when the Giants defeated the New England Patriots in Super Bowl XLVI. Following the season, he became an unrestricted free agent. On August 4, 2012, Martin signed with the New England Patriots. Martin was released by the Patriots on August 31, 2012 during final cuts, and was re-signed by the Patriots on October 31, 2012. On August 11, 2013, Martin signed with the Chicago Bears but was released on August 25. He was brought back by the Bears on November 13 after Charles Tillman was placed on injured reserve. Martin appeared in seven games in 2013 for the Bears, recording a tackle on defense and six on special teams. Martin was a free agent after 2013, but on February 24, 2014, he signed a one-year deal with Chicago. He was waived on May 28, 2014. On January 20, 2013, Martin's home was invaded while he was out with his team at the AFC Championship game where the Baltimore Ravens defeated the Patriots 28-13; two masked men back at home forced their way into Martin's home in Aurora and held a woman and some children at gunpoint. It is unknown whether the people held were members of Martin's family, and the police did not get a good enough description of the suspects to pursue a case. Police spokeswoman Cassidee Carlson said the suspects took some valuables, but wouldn't go into further detail about what was taken. ↑ "Derrick Martin Pro-Football-Reference Profile". rbref.com. ↑ Silverstein, Tom. "Packers' Hawk released but will re-sign". Milwaukee Journal Sentinel. ↑ "Bears place Hayden on IR, sign Hartson". Yahoo! Sports. 2013-08-11. Retrieved 2013-08-11. ↑ Mayer, Larry (2013-08-25). "Bears waive 14 players; roster now stands at 76". Chicago Bears. Retrieved 2013-08-25. ↑ Campbell, Rich (2013-11-13). "Bears re-sign safety Derrick Martin". Chicago Tribune. Retrieved 2013-11-13. ↑ Mayer, Larry (2014-02-24). "Bears ink Taylor Boggs, Derrick Martin". Chicago Bears. Retrieved 2014-02-24. ↑ Wilkening, Mike. "Bears waive Derrick Martin, add Michael Ola". Pro Football Talk. Retrieved 29 May 2014. Wikimedia Commons has media related to Derrick Martin.